Even with just one child, it can be difficult to keep track of things, and any mom with more than one knows that even something as simple as a short car ride or the trip to soccer practice can bring with it any number of problems. Well check one of those off your list - no more fighting over which cup or bottle belongs to which kid. Thanks to Inchbug’s Bumpyname personalized orbit labels, you can solve the problem permanently. 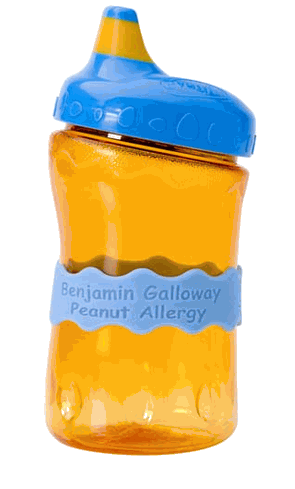 The flexible plastic bands stretch to fit around a variety of drink containers, from 4 oz baby bottles to 20 oz sport bottles, and if you’re feeling particularly clever you can even use the labels on items like shampoo, flashlights, or lotion. You can choose from pre-printed names or customize your own, even adding on information like allergies or a phone number to make sure important information is always close at hand. The bands come in a variety of colors and can be customized with Braille, and are nontoxic, reusable, and dishwasher and microwave safe. Most importantly, though, while only a small detail, these bands solve a number of problems, from making sure your toddler comes home with the same sippy he took to daycare to ensuring that each child takes the right bottle for lunch. Anyone will find a use for these clever tags, and moms will discover that having one less thing to think about will simplify their daily routines. For more information, visit the website at InchBug.com. Anyone will find a use for these clever tags, and moms will discover that having one less thing to think about will simplify their daily routines. The bands come in a variety of colors and can be customized with Braille, and are nontoxic, reusable, and dishwasher and microwave safe.